I think most women have already been familiar with plastic surgery term. Based on Wikipedia, plastic surgery is a medical field that specially concerned with the improvement or correction of appearance and function. Until now, many women still consider cosmetic surgery as the most well-known type of plastic surgery; don’t you know that actually there are other types such as reconstructive surgery, burns treatment and microsurgery? Whatever kind of plastic surgery that one undergoes, it definitely can improve one’s life –though there are still pros and cons about it. In my country, one famous example of constructive surgery patient is a woman called Lisa ‘face off’. 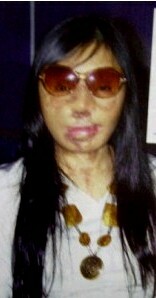 She’s a victim of cruel action conducted by the ex-husband who poured her face with dangerous mercury liquid. His blind jealousy caused a terrible pain and effect to Lisa’s face. Since 2006, she has conducted sixteen operations to construct her face. Lisa is a beautiful woman before; she must still experience several operations ahead to get her natural appearance back. Her last face contour still looks like a thick mask; but Lisa said that she has got her self-confidence back and she has no doubt again to go out and to be seen by others. It’s really a positive result, right? There’s a truth about an increasing amount of women worldwide who decide to get breast augmentation, a plastic surgery method for improving women’s breast size. Every woman has their own reason to conduct this treatment. I have a sister-in-law who had to undergo a mastectomy two years ago to remove cancer cells on her left breast. The mastectomy gave her health back but also incomplete feeling as a woman. When she asked my opinion about her intention to get breast reconstruction, I supported her totally! To know more about plastic surgery, you can get more information in the sites of reliable and reputable plastic surgeons like http://www.drmartinplasticsurgery.com. Ladies, always remember that only the trustworthy surgeons and staffs who can provide you with satisfying result! If you plan to obtain any kind of treatment, gathering information and consulting to an expert previously are must things to do. Selamat malam mba Lina,efek untuk operasi plasti banyak banget ya mba?